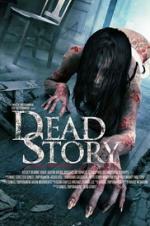 Buy or Rent Dead Story (2017) Movie DVD & BluRay Online! Movie Plot: Anne and her husband, Harold, have just moved into a new ranch home in search for solace, but during their house warming party a guest tells them the story of their new home’s horrifying history: a Dead Story that when told will eventually lead to their death. As the days pass they realize the dead story could in fact be true, and life becomes more terrifying than they could have ever imagined.